Over the past few months, I've taken on several new responsibilities - each with a special place in my heart and none of which I care to let go. I was, and still am, juggling it all without too many problems. I was simply feeling low and sluggish. This morning, I woke up, got ready, and went to church. Instead of coming home feeling edified and uplifted, I felt more weighed down than ever. Even overwhelmed and uneasy. So I went for a drive. I've been feeling the need to get away by myself for several weeks now. To give myself a chance to renew and refresh. It happens every once in a while and I usually indulge long before I boil over. I was long overdue. Usually, my drives are random, taking me along back roads or to empty parking lots to clear my head. Today, I felt prompted to go somewhere specific - the Brigham City Temple. I was also prompted to go straight there instead of meandering along like I usually do. The drive itself was unremarkable. I pulled into a parking spot on the street to the south of the temple. But I felt the need to stay in the car. So I pulled out my journal, intending on writing out my thoughts while it was quiet and still. My previous journal entry caught my eye. "Last night, I had a dream. My home was destroyed by a tornado I had successfully avoided. Toys and other belongings floated down from the sky and littered the yard. I was devastated. My beautiful home had been reduced to a mere framework of splintering timbers and rubble. "While at the hotel, a nearby volcano exploded, sending a pyroclastic cloud our way. But the strength of the walls and windows kept us safe. As the last of the cloud diminished, the windows failed, but we were not harmed. "I calmly began cleaning up and putting things in order. "What struck me most about this dream is my action, not reaction. I've had natural disaster dreams in the past. Running from funnel clouds and not finding a safe haven. Or trying to outrun lava floes that keep emerging from under my feet. It's always a sign of loss of control, a chaotic presence in my life. "This time, however, I didn't run. I stood my ground. I was prepared. And once the danger passed, I began to work to make things right again. Even the loss of every one of my earthly possessions couldn't stop me. "I had been feeling disorganized and confused. Even overwhelmed. But now, I feel a peace I haven't felt in some time. A knowledge that no matter what happens, I am strong enough to press on. I will not crumple and fall. "And, just like in my dream, I am not alone. When all had been lost, my friends and family were there to help me pick up the pieces. 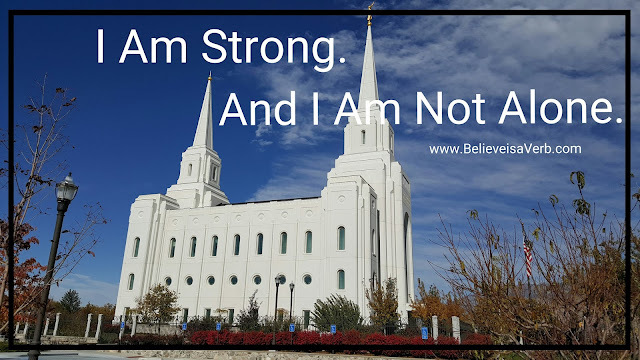 "I am strong. And I am not alone." Those words, written in July, echoed through my head. Just as in my journal entry, I had been feeling disorganized, confused, and overwhelmed again. I needed a reminder that I am strong. I am not alone. That simple act, those simple words, buoyed me up and gave me the spiritual cleansing I needed. It renewed my strength so I can stand tall and fulfill my potential. Thanks to the guiding influence of the Holy Spirit, I was once again reminded. And I am not alone because He, our God and Eternal Father, cares about me and my happiness. He is watching out for me.